It’s not even about new collections, and new brands. It’s really about the fact that this article includes highlights from Fashion Week S/S 2019 as well as A/W 2020 as the pieces from last season are just as hot today as they were six months ago #slowfashion. Good luck guessing what we discovered this Jannuary at NEONYT, and previous season at the Ethical Fashion Show, Green Showroom, PREMIUM, Show & Order and SEEK. Oh and if you were wondering what happened to the Ethical Fashion Show and Green Showroom: they are now hosted by Messe Frankfurgt and renamed to NEONYT, which is derived from the Ancient Greek word “neo” (meaning new and revolutionary in English) and the Scandinavian word “nytt” (also meaning new). So all together it stands for “The renewed new”. You can find out more details on why NEONYT is so much more than just your average fashion fair right here. Recyc Leather has developed a new process using existing machinery to recycle leather waste and make it soft enough for shoes. From 2017 to 2018 they have had a 400% rise in production of their BSCI certified material from 50 to 200 tons. That’s the weight of over 16,000 buses in form of material which has been saved from waste! Find the recycled leather from above in this shoe from oth., not only do they use recycled leather (not exclusively though) but their signature material is old car tires, which they use for the soles, around that you see natural rubber, and the inside is of recycled polyester. They are 6 months old, represented in 8 countries, and have already recycled 0325 tires. Woo-hoo! What else these sneakers are good for? Get in touch with the oth. crew and they can hook you up with a pair of optional roller-skates to click onto your soles. Happy Genie brings vegan handbags into the market which are made of apples and have changeable design options for each bag. MUD Jeans continues to step their game up mixing organic cotton with post-consumer recycled cotton for a new pair of denim. They create their washed looks using laser and ozone techniques. At this point they have been able to produce jeans with up to 40% recycled cotton. 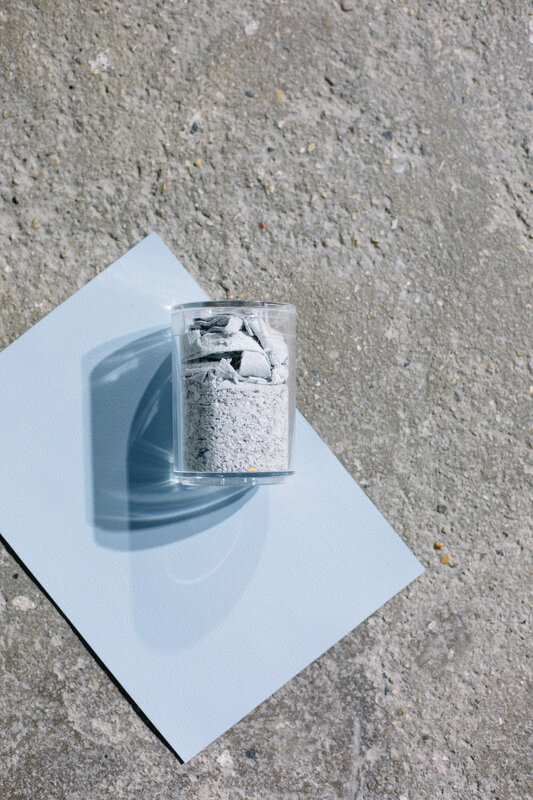 Circular.fashion is an agency which works with brands to develop a circular fashion system. 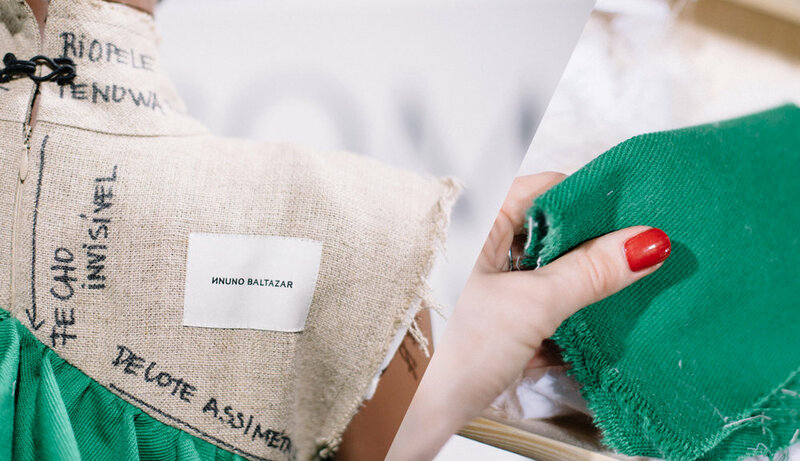 Two brands they work with were also featured in our last Berlin Fashion Week recap. At the fair they presented a selection of circular fabrics they can hook you up with. LUXAA is constantly working on new fabric innovations, and has quite the collection to read up on on their website. White shirt is made of their patented material Tyvek® which made from the same substance as the “technical paper” which architects use, some of many characteristics are that it is free of chemicals, vegan, 100% recyclable, very durable, ground water and pH neutral. ALINASCHUERFELD has been using more sustainable solutions for her ethical luxury shoes since 2009. These pair are made of certified organic salmon skin, which is sourced as a waste product of the food industry. Aside from this the shoes are made chrome free, using vegetable and rhubarb tanned leather. SURPLUS prints poetic, political and thought provoking short poems on (exclusively) fashion waste, second hand and vintage. Blue Ben showcased their first water saving collection at the blogger lounge, aka PrePeek. This sweater is 100% fairly made in Europe with no plastic, and uses less than 10% the amount of water which a comparable jumper made of cotton would need. As if that is not enough 10% of Blue Ben’s proceeds go to their own NGO Drip by Drip which invests in clean water solutions for Bangladesh as well as research for more water saving materials which the fashion industry can use. WHAT SUSTAINABLE FASHION APPROACHES ARE THE MOST IMPORTANT TO YOU?